Window tuck box - Note: The front of the first card will be the side that is displayed through the window of the tuck box. 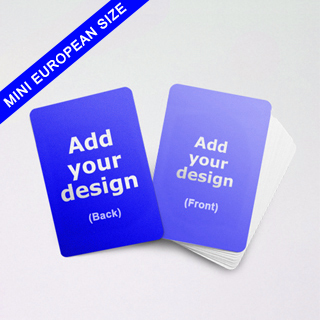 The Mini European Playing cards is a new addition to our selection of game cards. This deck of cards are smaller, measuring at 44 x 67mm which is great for board games or card games that require game cards in a smaller size and is great for games which require images as well as text and information, perfect for trading card games. Choose from a deck of 54 cards up to 246 cards depending on the requirement of your board game or card game. Choose from our range of card designs or you can fully customize your deck of Mini European playing cards to follow through with the rest of your board game, table top game or card game design by adding your artwork to our easy to use online builder. Place your artwork onto both sides of the card and add your own text too if required. Please make sure your artwork are within our bleeding and safe areas and that they are high resolution images at 300 DPI and CMYK color mode to ensure your cards are printed at the highest quality. The first front card will be the one facing out so place your barcode on this card if required. After your designs are uploaded, you can preview the final deck of cards before placing your order. 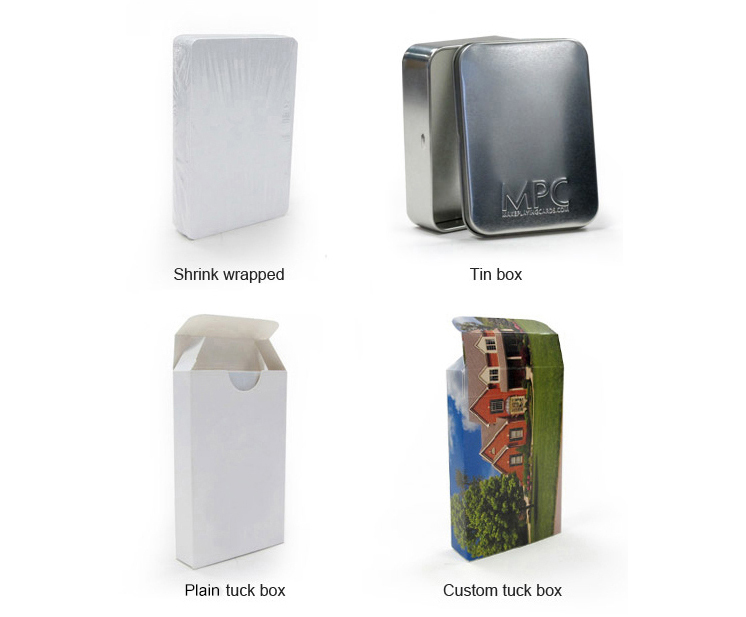 You can also choose from our 3 finishing options. By choosing the standard finish, your cards will be made from 300gsm casino quality card stock with an aqueous coating (smooth finish). The premium finish features 310gsm casino quality card stock with a plastic coating (linen finish), where the material originates from France. Finally, the premium finish really adds a professional touch as the material is 100% PVC plastic with a thickness of 0.325mm originating from USA. All our cards are made from high quality materials ensuring a durable and long lasting deck of cards for your board game, table top game or card game. Boardgamesmaker.com is a printing and manufacturing company specializing in the board game and table top gaming industry. We have other 35 years’ worth of experience and knowledge and a proven track record with our clients who choose us time and time again to print their board games, table top game and card games. We provide our services to casual board gamers as well as professional table top game developers to help create their board games or card games for mass production, prototyping and Kickstarter projects. We have a range of custom game components and custom board game accessories and our game cards are one of our products. From playing cards to TCG decks, we are able to provide full production quality printing on one deck or a bulk order of decks as we have no minimum.